Bell & Ross takes the transparency of the skeleton watch a step further with the BR-X1 Skeleton Tourbillon Sapphire – floating a minimalist, open-worked movement inside a clear sapphire crystal case. The brand mastered the art of cutting, and polishing the notoriously brittle material last year, launching itself into the high-dollar orbit of Richard Mille and Hublot, the foremost adepts of the sapphire watch case. That’s thanks to the fact the Bell & Ross’ parent, the Parisian fashion house Chanel, also owns one of the best case and components makers in Switzerland. The new skeleton tourbillon is the third instalment in the Bell & Ross sapphire series that started with the half-million dollar BR-X1 Chronograph Tourbillon Sapphire, and followed by the extra-flat BR-X2 Tourbillon Micro-Rotor. 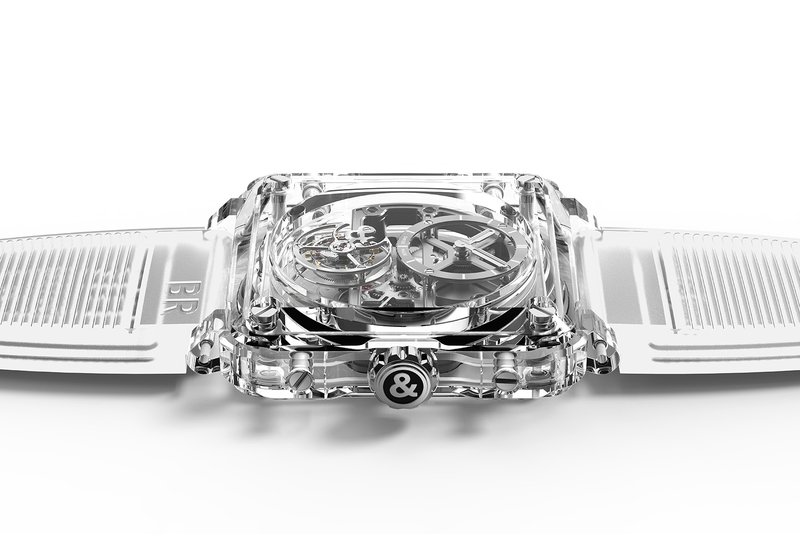 The large, 45mm case of the BR-X1 Skeleton Tourbillon Sapphire is made up of nine pieces of clear sapphire crystal, the case middle, back, top, crystal and four bumpers, held together by vertical and lateral screws. 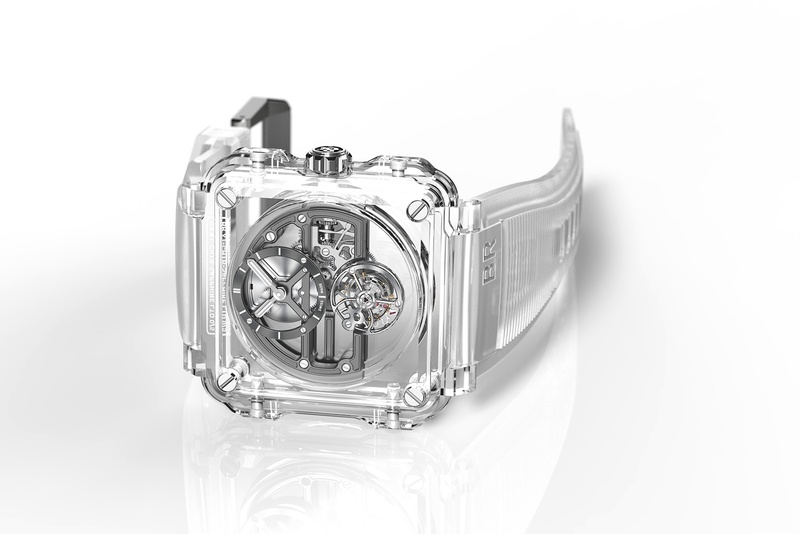 Notably, despite the complexity of its construction, the case still manages a water-resistance rating of 30m. The transparency of the watch is undergirded by the skeletonised hand-wound BR-CAL.288, a hand-wound movement with 100-hour power reserve. 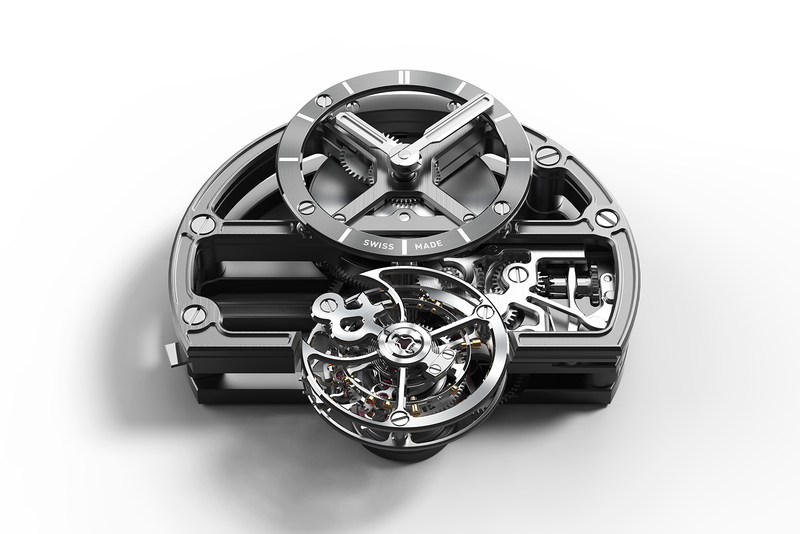 Designed so the main plate and bridges form three horizontal struts, the movement has an architectural, airy feel. The hour and minute hands sit just above the barrel, with the gear train arranged vertically and the flying tourbillon at six. Despite the modern styling of the movement, the balance wheel is traditional in detail, featuring solid gold screws for poising. 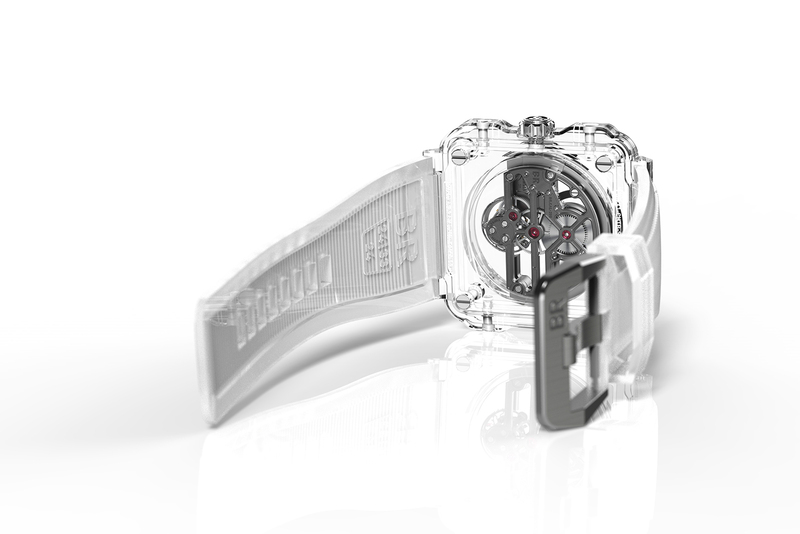 It is a variant of the BR-CAL.285 found in the preceding BR-X1 Tourbillon Chronograph, but with a different architecture to ensure a panoptic view of the tourbillion from the top, bottom and sides. Like many of Bell & Ross’ complications, it was developed by movement specialist MHC Manufacture Haute Complication. 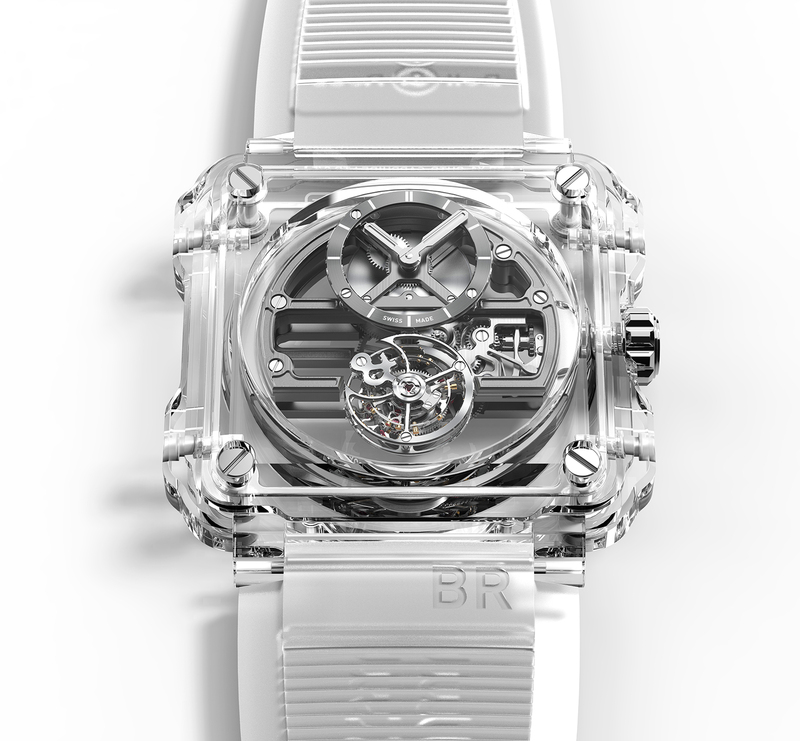 The BR-X1 Skeleton Tourbillon Sapphire (ref. BRX1-SKTB-SAPHIR) is a limited edition of just eight pieces and is priced at US$385,000 or S$535,000.